Take one of, if not the, most influential French chefs of our time, marry him to an American/Korean bride with a passion for the food of her birthplace, and presto-change-o, you have the ultimate fusion lunch. That’s just what the Vegas Uncork’d participants got last weekend at Prime — in a setting so beautiful it’s a bloody shame they don’t use it for lunch more often. Between questions about their marriage (mostly having to do with who cooks what) Marja Vongerichten and hubby Jean-Georges Vongerichten dazzled diners with a three-course lunch blending the best of both cuisines. Marja — she of PBS’s Kimchi Chronicles — told the emotional story of re-connecting with her birth mother and the foods of her homeland, years after she’d been adopted and raised in America. We also learned that famous French chefs don’t do a good j0b of cleaning up after themselves at home. JGV also opined (in response to our question) that eating fresh and local was not only “the next big thing” but one destined to leave a permanent mark on the world’s restaurant scene. 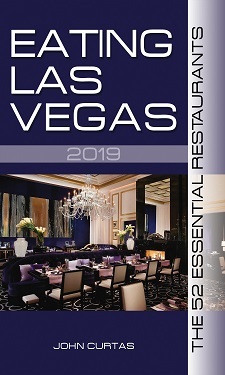 All told, it was one of those “only in Vegas” moments that Uncork’d is known for, and another example of why we have the most unique restaurant scene in the world. and don’t forget Johnny the sommelier always doing a fantastic job too. Koreans know bean sprouts like the French know sauce. For one day, I felt like Edward VII.